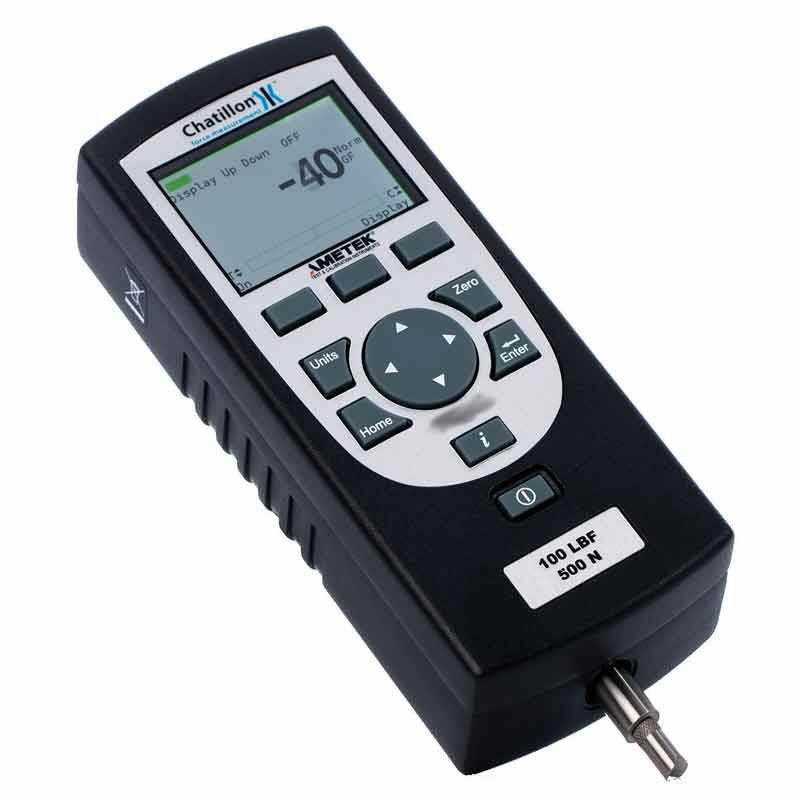 Have a question about the Chatillon Digital Force Gauge - DFS II/DFS II-R? The Chatillon DFS II is available for testing capacities that range between 2 lbF [10 N] to 500 lbF [2500 N]. 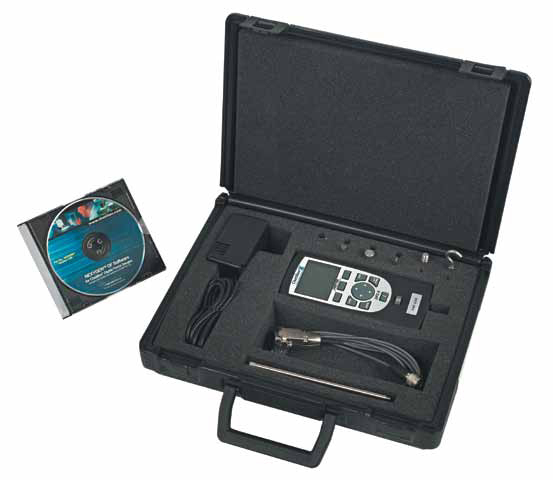 It offers the best price performance of any digital force gauge available today. It uses a remote SLC load cell, which is dedicated to the unit. This offers the ability to test in locations where a fixed and integral load cell is impractical. The brand new DFS II series is the first of its type to offer users wireless data transfer and via Integral Bluetooth® Communications. It is ideal for both hand-held and test stand applications. The DFS II Series is often used to collect data for tear strength testing on new materials. It provides the opportunity to perform statistic analysis on the data directly on the screen. When mounted to a Chatillon LTCM Series test stand, it is possible to perform testing at the end of a production line and directly transfer the results to a PC for further analysis. 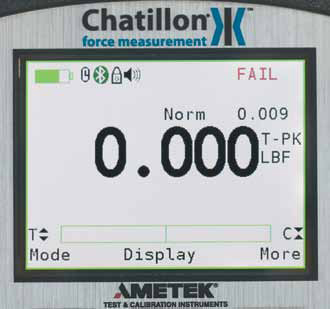 The Chatillon® DFS II-R provides users with a large, easy-to-read, high-resolution, full-color dot matrix LCD display. It supports a wide range of standard gauge functions, such as normal and peak readings, high/low limits, set points, and pass/fail results. It also provides statistical results, load comparisons, load averaging, % and sharp break detection, load cell actuation, and direction. The DFS II is designed for use with both basic and complex applications. 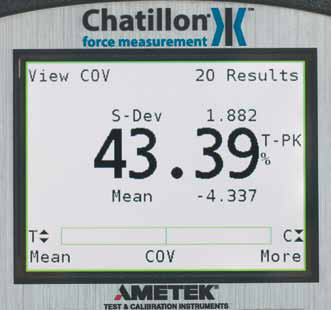 In addition to providing tear strength testing, the Chatillon® DFS II-R can be equipped with integral load cells or smart remote sensors to provide load measurement or torque measurement, as needed. Dedicated and non-dedicated SLC Remote Load Cells, and non-dedicated STS Remote Torque Sensors can be used with the DFS II-R, depending on testing requirements. The Chatillon® DFS II-R Series provides two types of break detection, including a sharp break and a % break detector. A sharp break can be used to detect whenever the load measurement drops 5 percent from a peak load. The user can choose to override the sharp break and select a custom percentage to define the break. This is a beneficial option for samples that have high elastic characteristics. Automate and expand functionality with the Chatillon DFS II-R when you use ForceTest Windows-based software. ForceTest interfaces directly to your digital force gauge, enabling you to perform tests and graphs automatically, using a PC. It features an intuitive user interface to ensure that tension, compression, torque, peel, and friction tests are easy to set-up and perform. A wide variety of options are available to customize the experience. Reduce set-up time with pre-set test methods and password protection for security and consistency. Easy export and reporting in a spreadsheet format for quick analysis and data manipulation. The Chatillon DFS II-R allows for use in multiple languages, including English, Spanish, French, German, Portuguese, and Chinese. The user can view the screen in full color and select the local language. Standard digital and analog outputs are available in the DFE II Series, which support baud rates between 9600 – 115,600. 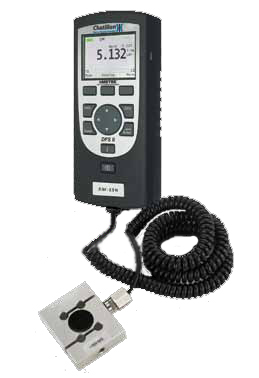 USB communications are also available with this system, as well as protocols for Chatillon test stands, Mitutoyo devices, and an Alternate protocol.